Circa Survive is so sneaky. They’re done recording for a while… oh wait, here’s an EP as a Hurricane Sandy benefit. They’re done touring… oh look, there they go to Australia with Coheed and Cambria. Anthony’s just going to do a quick solo tour… oh snap, here he is playing with the dudes from Saosin. 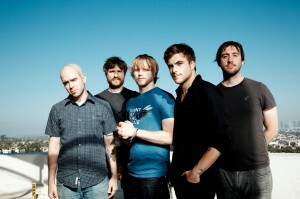 And now it’s Christmas… so Circa Survive has given us the pleasure of posting two recordings of Christmas rock songs, “Jingle Bell Rock” and “I’ll Be Home For Christmas”. Personally, I’m against Christmas music, for it is endlessly repetitive. That said, I love when bands like Circa cover Christmas songs because it means that somewhere, a retail employee gets to listen to something other than the same old versions over and over again. I used to be that retail employee. Thank Circa for new tunes. To stream or download the two songs, just click “Read more”.